WARSAW, January 14. /TASS/. Mayor of Poland’s Gdansk Pawel Adamowicz has died in hospital after being stabbed on stage during a charity event the day before, medics said on Monday. "Regrettably, we must say that we have lost the struggle for Mayor Adamowicz’s life. 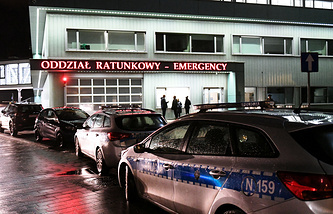 He has died," said Dr. Tomasz Stefaniak, director of health at the University Clinical Centre in Gdansk, who conducted surgery overnight to Monday. Adamowicz, 53, was attacked while he was on stage for the finale of a charity event. The attacker found his way onto the stage and stabbed the politician in the heart three times. The mayor was taken to hospital where he underwent a five-hour surgery. Medics said he had lost a lot of blood, with his heart, diaphragm and abdominal organs being seriously injured. The 27-year-old attacker, who has police record on robbery charges, was detained at the scene. He is said to have serious mental problems. Adamowicz has been Mayor of Gdansk, one of Poland’s largest cities, since 1998.